Reading time: ~ 17 min. or so. The “Riders” collection is the result of a personal challenge for Inktober 2017. My fascination with the uniform-like cool jackets, the elaborated helmets and the innovative motorcycles must originate from my years-long exposure to Japanese animated series during the ’80s. Futuristic helmets - brightly coloured - concealing the faces of heroes, while their huge and expressive eyes are still visible behind the dark glass! Go Nagai’s Mecha-riding protectors of the Earth - and often whole intergalactic sectors - in Mazinger Z, Getter Robo and Grendizer. The space nomads of Robotech with their mecha-fighters, also known as Veritechs. 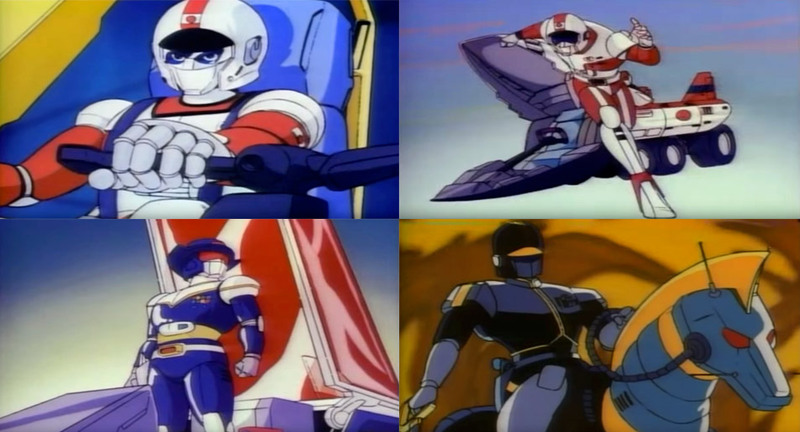 The protagonists of Saber Rider with futuristic spacesuit designs that combined more traditional themes (Cowboy, F1 Racer and Royal British army) (Image 1). They all shared a common theme in my eyes: adventurers operating cool-looking SCI-FI Mechas in their full cartoon gear! 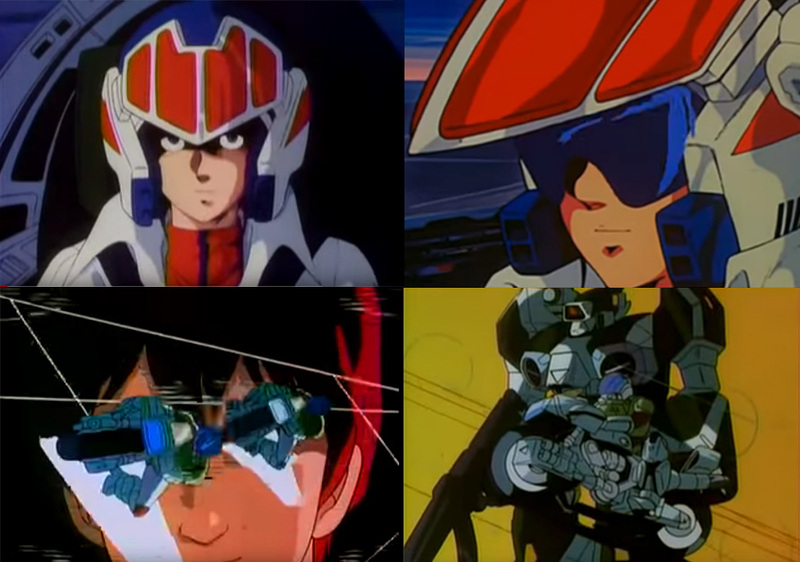 Watching Robotech’s Rick Hunter raising his gaze from the cockpit, in the series’ intro video, while motorcycle riders are parading on the screen, combined with an inspiring theme, calling us to adventures (Image 2, Robotech Intro); Even further down the title sequence, an awesome motorcycle overshadowing a powerful militaristic mecha (Image 2). To top it all off, the enigmatic, femme fatal, Sheila Misty and her raven-black motorcycle from Image 3. I devoured those visual themes. The combination of man and hi-tech machines left an imprint on my mind. 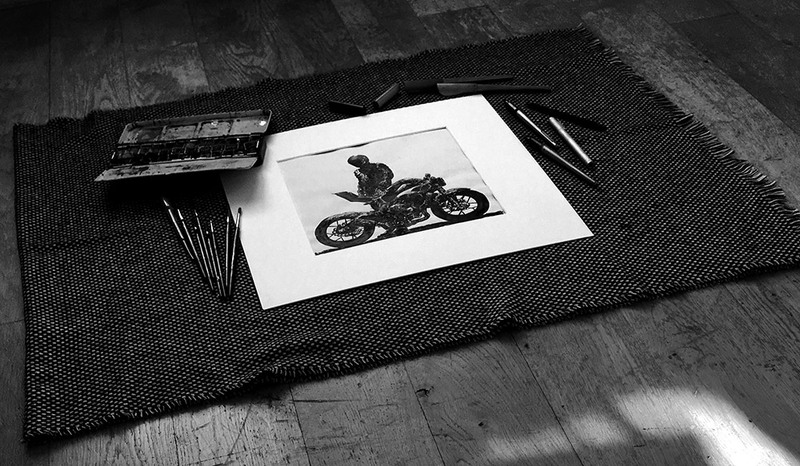 Years later (~autumn 2017) while I was searching for a theme for my Inktober challenge, one that would free me from the persistent search of “…what should I draw next?”, I was looking for something meaningful - to trigger my sense of “creative exploration” - and it didn’t take me long to decide on the theme of motorcycles riders. To take myself even further from my comfort zone, I even selected new art tools: The Pentel thick calligraphy pens, loaded with Rotring ink on the square Sennelier 250-paged sketchbooks. This resulted in a more bold and disruptive style than my previous work. Every day I would sit down early in the morning and start [badly] sketching riders on their motorcycles. Trying to break free from precise measurements of the machines I was creating at least 7 sketches every 30 minutes. Eventually the results starting to look less rigid and precise, and more fluid and expressive. After a while they even started looking “not as bad”. Two and a half months and around 400 sketches later, I started to feel more comfortable with the results. I have selected my 30 favorite ones, then the top 12 and added watercolours to them. The originals for those 12 are available for sale here. Links for purchasing prints of various sizes can be found here. See in you in space. © 2019 JamesDoe. All rights reserved.